Welcome to Redline Indoor Karting. Redline Indoor Karting is one of the few independent Indoor Karting Circuits in Wales where you can enjoy the lowest prices without compromising quality. Located in an area of outstanding natural beauty, Redline Indoor Karting is situated in Caernarfon, Gwynedd, North Wales. Within close proximity to Anglesey, Conwy and all other parts of North/Mid Wales and the North West. 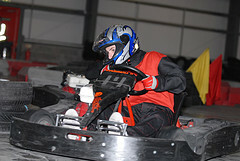 Indoor Karting is one of the fastest growing adrenaline sports in the world. Bring your friends and family, or even workmates, and challenge them to a truly exhilarating race!! Karting is commonly perceived as the stepping stone to the higher and more expensive ranks of motorsports - Why not try to become the next Lewis Hamilton!! All manner of groups and individuals are catered for, from absolute beginners to corporate hospitality events - all under the expert supervision of our fully trained staff.